Michael Burritt is one of the world’s leading percussion soloists, and has performed on four continents. He is Professor of Percussion and department head at the Eastman School of Music. Michael Burritt is one of the world’s leading percussion soloists, and has performed on four continents. He is in high demand, holding concerts and master classes throughout North America, Europe, Asia, and Oceania. Burritt has been a soloist with the Dallas Wind Symphony, Omaha Symphony, Chautauqua Symphony Orchestra, Richmond Symphony Orchestra, the Tempus Fugit Percussion Ensemble (above all USA), Ju Percussion Group (Taiwan), Percussion Art Quartet (Germany), Amores Percussion Group (Spain), and Peaux (Sweden). Burritt has released three solo recordings – Perpetual, Shadow Chasers, and Waking Dreams on the Resonator Records label. These all feature Burritt’s original compositions as well as works written expressly for him. He has been a featured artist at seven Percussive Arts Society International Conventions. In 1992 he presented his New York solo debut at Carnegie Hall and in 1998 performed his London debut at Queen Elizabeth Hall. Burritt has extensive chamber and orchestral experience and has performed with the Chicago Chamber Musicians, the Chicago Symphony, the Rembrandt Chamber Players, and the Peninsula Music Festival Orchestra. He is also an active composer, with two concertos, numerous solo and chamber works for marimba and percussion, as well as two books of etudes to his credit. His works for solo marimba have become standard repertoire for the instrument and are frequently performed at international competitions. He has received commissions from the World Marimba Competition in Stuttgart Germany, Third Coast Percussion Quartet, Exit 9 Percussion, Louisiana State University, the Northshore Concert Band and the Tempus Fugit Percussion Ensemble. Mr. Burritt’s works are published by Ludwig Music, C. Allen and Keyboard Percussion Publications. Burritt is also an artist/clinician and product design/consultant for Malletech, where he has developed his own line of signature marimba mallets and an artist/educational clinician with Zildjian. Burritt is a member of the Percussive Arts Society Board of Directors, a contributing editor for Percussive Notes Magazine, and chairman of the PAS Keyboard Committee. 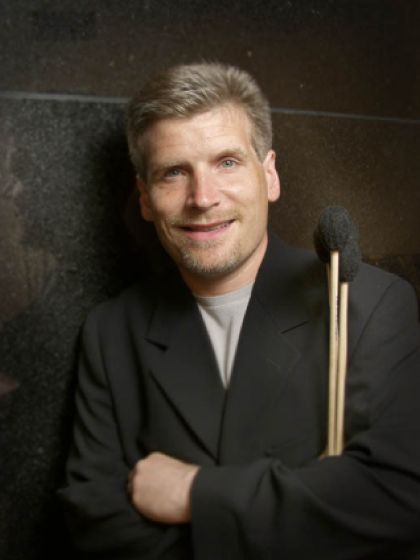 Michael Burritt is Professor of Percussion and department head at the Eastman School of Music. Prior to his appointment at Eastman, Burritt was Professor of Percussion at Northwestern University from 1995-2008, where he developed a program of international distinction. Burritt received his Bachelor’s and Master’s of Music Degrees, as well as the prestigious Performers Certificate, from the Eastman School of Music in Rochester, New York. Among his instructors have been John Beck, Gordon Stout, Paul Yancich, and Herbert Flower. Emmanuel Séjourné is the famous French percussionist and the Head Teacher of the Percussion Department at the Strasbourg Conservatory. French composer Emmanuel Séjourné composes pieces that are rhythmic, romantic, energetic, an inspired both by the Western classical tradition and popular culture (jazz, rock, extra-European). His compositions are played worldwide and have become part of the repertoire of a number of orchestras including the Nagoya Philharmonic, Osaka Philharmonic, Sinfonia Toronto, Croatian Radio Television Symphony, Luxembourg Philharmonic, Lausanne Chamber Orchestra, Orchestre de la Suisse Italienne, Camerata de Bourgogne, Orchestre d’Auvergne, de Cannes, Nice, Pau, Bochumer Symphoniker, Wurttembergisches and Kammerorchester. He has received commissions from Gary Cook, John Pennington, Ju Percussion Group, Bob Van Sice, Nancy Zeltsman, Marta Klimasara, Katarzyna Mycka, and the Amsterdam Percussion Group. His passion for the stage, meanwhile, led him to write and compose “Planète Claviers” for the Percussions Claviers de Lyon, work commissioned by the Grame Festival. This wild and unusual show was performed 120 times between 1998 and 2001. Fascinated with the relationship between various forms of artistic expression, Séjourné writes music for both stage and television. He composed the music for the Ballet du Rhin’s performance Les Envahisseurs, played during the 2000th anniversary of the founding of Strasbourg, and in 2004, he wrote the musical comedy School Boulevard for the Luxembourg National Theater. Séjourné also performs as an instrumentalist. Together with saxophonist Philippe Geiss, he founded the ensemble Noco Music, which featured in the European Audiovisuel Grand Prix. As a soloist, as well as with the ensemble Accroche-Note, he has premiered over 100 pieces of music including concertos, chamber music, and solos, performing all over the world. Eager to share and communicate his passion, Emmanuel Séjourné is also Head Teacher of the Percussion Department at the Strasbourg Conservatory. Wu She-E is a well-known marimba solo artist and educator. She is Associate Professor of Music and the Head of Percussion at Northwestern University. Wu She-E has appeared as a solo artist at the Percussive Arts Society International Convention, Journées de la Percussion, NancyPhony Festival, perKumania Festival, and PercuPassion Festival; Bach Symposium/Bach Variation Festival at Lincoln Center; Taiwan Connection concert at Lincoln Center; International Percussion Festival and InterAmerican Music and Arts Festival Orchestra in Puerto Rico; Festival Internacional de Percusion "Ritmo Vital 2001" and National Percussion Convention in Spain; Fukui Marimba Seminar in Japan; Seoul Percussion Festival in South Korea, Giornate della Percussione in Italy; Percussion Festival in Greece; Majaoja Percussion Competition and Festival in Finland; DrumFest in Moscow; Groove Alentejo in Portugal; Taipei International Percussion Convention, and many other festivals. She has performed with the Chicago Symphony Orchestra at Carnegie Hall, with the Chicago Chamber Musicians, and with the Philadelphia Orchestra at Kimmel Center. Ms. Wu has also performed as guest recitalist and clinician at universities, colleges, and conservatories throughout the United States, Europe, and Asia. Wu has commissioned and premiered works by Paul Lansky, Lee Hyla, Dafnis Prieto, Eric Ewazen, Ronald Caltabiano, Robin Engelman, Gerald Chenoweth, and many others. In 2015, she delivered the world premiere of Percussion Concerto with Wind Ensemble written by Paul Lansky with the Northwestern Symphonic Wind Ensemble, directed by Dr. Mallory Thompson. Wu’s compositions include: Blue Identity, written for the Paris Conservatory CNR Percussion Ensemble, which premiered in Paris; K-PAX, commissioned by the Taipei International Percussion Convention, which premiered in Taiwan and Japan; UP!, commissioned and premiered by the Spring High School Percussion Ensemble at the Midwest Clinic in Chicago; and What the Sun Would Say to the Sky, which premiered at the Percussive Arts Society International Convention. Wu has served as a jury member at percussion competitions in France, Greece, Italy, Finland, Japan, Russia, Portugal, and the United States. Ms. Wu's recordings include Marimba Concerto by Eric Ewazen with the International Sejong Soloists, the solo marimba CD Snapshot, Suite for Marimba and Flute by Alec Wilder with flautist Bart Feller, A Set of Songs and Dances by Doug Hill with Gail Williams (French horn), and Chesapeake, a recording done with the American Brass Quintet of work by David Sampson released in 2015. Highlight engagements for the 2016-2017 season will include Imaginary Day; a Duo Percussion Concerto by Pat Metheny with the Philadelphia Orchestra; and concerts/master classes in Russia, Portugal, South Korea, England, Norway, Scotland, Finland, and the United States. Ms. Wu is a clinician and a recitalist for Majestic, Mapex, Innovative Percussion, and Zildjian. Ms. Wu's signature mallets with Innovative Percussion are available worldwide. She plays on a concert marimba of her own design by Majestic. 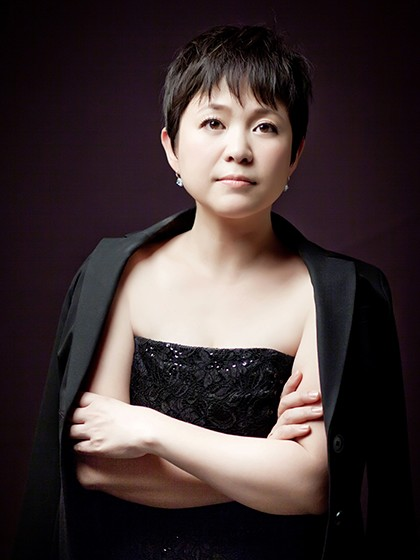 Wu She-E is Associate Professor of Music and the Head of Percussion at Northwestern University, a frequent visiting guest artist at the Royal College of Music in London, and a consultant at the Manhattan School of Music in New York City. 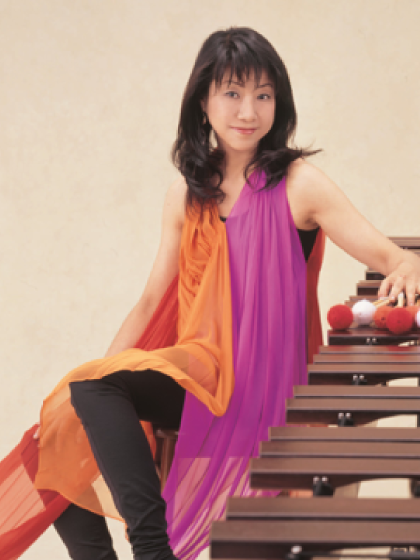 Marimba soloist Momoko Kamiya is recognized worldwide for both her performances and teaching. She is a Professor at Senzoku Gakuen College of Music, a Guest Professor at Tokyo College of Music and Elizabeth Music University, and also on the staff of Kunitachi College of Music. Momoko Kamiya first received international recognition when she was awarded the first prize at the Luxembourg International Marimba competition in 1995. The Toyota Foundation selected her as one of ”The Top Young Artists Today“ in 2001. In 2005 she was recognized by Kawasaki City, Japan for her distinguished musical activities and received the Azalea Cultural Prize. She was the first successful candidate accepted to Tokyo University of Fine Arts and Music as a marimba soloist, after which she attended the Juilliard School, obtaining a Bachelor of Music in three years. For many years, she has held concerts throughout Japan and around the world. Momoko is also a regular jurist at prestigious international competitions, such as the Mozarteum International Summer Academy. Momoko is also acclaimed for the many seminars and master classes she holds across the world. In 2008, she had her New York City debut at Carnegie Hall. In 2011, she gave the world premiere of the Marimba concerto Elpis composed by Kazunori Miyake with the Thailand Philharmonic Orchestra. She has released five recordings on the Phillips label. Her most recent offering, Pieces of Peace, was released on the Classic Concert label in 2011. Since 2014, the RESTA-JAY society has provided her signature mallets. Wu, Pei-Ching, internationally renowned marimbist, obtained her master's degree in Percussion Performance from Northern Illinois University in 1994. 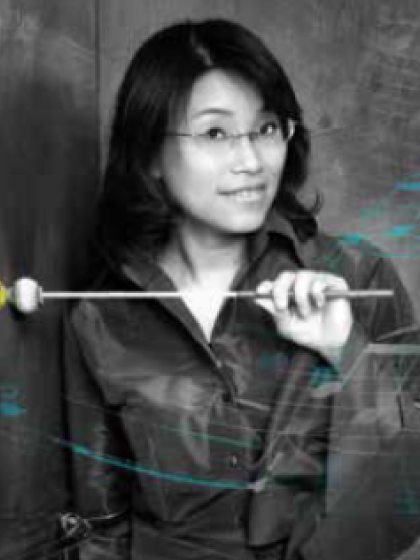 With dissertation entitled Extended Multiple Mallet Performance in Keyboard Percussion, which illustrates six-mallet techniques through two Taiwanese compositions, Wu earned her doctorate from West Virginia University in 2005. Her teachers include Ju, Tzong-Ching, Keiko Abe, Robert Chappell, Richard Holly, Tim Peterman and Paschal Younge. A founding member, Wu has served as Principal of the Ju Percussion Group since she was 18 and gives recitals regularly. In 1999, she was invited to perform with the Amadinda Percussion Group in Budapest Spring Festival. She also performed with Martha Argerich in Taipei in 2001, In 2009, Wu was nominated for the 8th Taishin Arts Award with “The Glamorous Match”. She was invited to perform at Marimba 2010 I.F.C to critical acclaim. In 2012, Wu was nominated for the 10th Taishin Arts Award with her 2011 marimba recital“Wonderland”. In 2014, her Six Mallets Marimba Recital “Journey of Dreams” is loved by the audience. Presently, Wu is an Associate Professor of Music at the Taipei National University of the Arts, senior member of Ju Percussion Group and teaches at the National Taipei University of Education and Shih Chien University. Jean Geoffroy is the famous percussion soloist and educator. 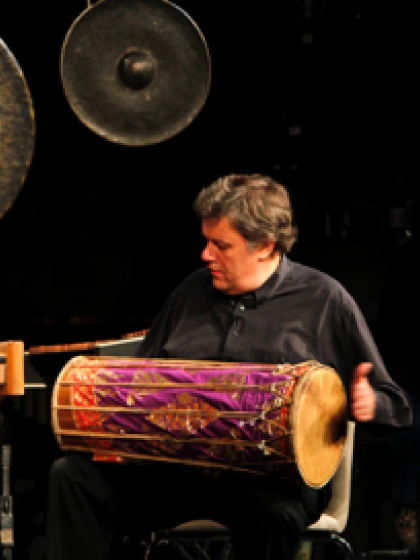 In 2015, he became artistic director at Les Percussions de Strasbourg. After completing his studies at the Paris Conservatory, Jean Geoffroy forged his own path in the world of percussion. He was principal timpanist for the Paris Orchestral Ensemble from 1985 to 2000, soloist and founder of the contemporary music ensemble Court-Circuit in 1988, and member of the Yehudi Menuhin Foundation’s Music Presence. Geoffroy continues to be a tireless performer who infuses life into new works; he has participated as a soloist on more than thirty CDs and DVDs, of which six the works of Johann Sebastian Bach, namely the complete cello suites, violin partitas and sonatas, and the Goldberg Variations. His newest CD, Hors Jeu, will be released in 2017. Many compositions have been written for Geoffroy, and he has given the premiere of many works for solo percussion. He has also performed as a guest soloist at many of the most prestigious music festivals worldwide. Aside from being a soloist, Geoffroy has been giving recitals and master classes at major universities all over the world for more than 35 years. Passionate about teaching, he is the author of several books on education including a book on percussion pedagogy published by City of Music Paris entitled Point of View Collection and has been an editor for 10 years with the same publisher. He has also edited several collections for Lemoine and Alfonce..
From 1995-2004, he was a regular at IRCAM classes, during which time he created a significant number of pieces for solo percussion with electronic and chamber groups. Geoffrey remains a member of the lecture committee at IRCAM. 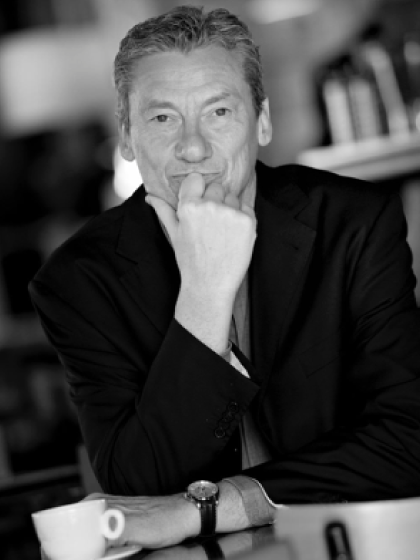 Mr. Geoffroy was artistic director at the Eklekto International Percussion Center in Geneva (2006-2013), chairman and artistic director of the Giot International Competition (for vibraphone), president of the Geneva International Competition for Percussion (2009), and has served as a jury member at many international competitions. He has also been guest conductor for the Mésostics ensemble, with which he plays regularly and has recorded a CD/DVD that has been critically acclaimed. In 2015, he became artistic director at Les Percussions de Strasbourg. Famous percussionist. In 1984, he founded Amadinda Percussion Group. Since 1990 he has been a Professor at the Franz Liszt Academy of Music. Born in Budapest, Zoltán Rácz began his musical studies in 1967, starting on the piano and moving some years later to other percussion instruments. Having studied at Béla Bartók Conservatory, he graduated from the Ferenc Liszt Academy of Music in 1983. As a student, Rácz became interested in percussion solo and chamber music. He has regularly participated in the programs of Budapest’s New Music Studio and has premiered several pieces both in concert and on recordings. During the Bartók Centenary Year (1981) he performed and recorded Sonata for Two Pianos and Percussion with Zoltán Kocsis and Dezsı Ránki. In 1984 he founded Amadinda Percussion Group, and remains the group’s artistic director. Amadinda has become one of the world’s most renowned percussion groups, delivering stunning performances at Paris Autumn, Prague Spring, Zagreb Biennale, Warsaw Autumn, Tampere Biennale, Bath Festival, Huddersfield Contemporary Festival, BBC Proms, Berlin Biennale and Wiener Festwochen. Amadinda has performed also at Carnegie Hall and Meyerson Hall in the United States, as well as Japan, Mexico, Australia, China, Lebanon, Armenia, and Taiwan. Amadinda has released more than 10 CDs under the Hungaroton label, including the complete percussion works of John Cage. Additional recordings were made for TELDEC (The Ligeti Project ) and for Tzadik. In 1988 Amadinda Percussion Group was awarded the Franz Liszt Prize by the Hungarian government, and received the Order of the Merit of the Hungarian Republic from the President of Hungary in 1997. In 2004, Amadinda received the Kossuth Prize, the highest artistic prize offered in Hungary. The group was also recipient of the prestigious Bartók Béla – Pásztory Ditta prize in 2008. Zoltán Rácz has appeared as both soloist and conductor. He has played and recorded for the BIS label Peter Eötvös 's percussion concerto Triangel - under the baton of the composer himself. Rácz performed Bartók's Sonata for Two Pianos and Percussion with András Schiff and Bruno Canino at Wigmore Hall London, the Berliner Festwochen, the Mondsee Festival, and the Venice Biennale. The piece was recorded under the DECCA label. He was principal timpanist at the Budapest Festival Orchestra between 1992 and 1996 as well as editor of a contemporary music program for Hungarian television for five years. From 1997 until 2005 he was member of the artistic advisory board of the Budapest Spring Festival, Hungary's most important annual artistic event. Since 2006, Rácz has been music director for Hungary’s leading contemporary music group—the UMZE Chamber Ensemble. He has appeared as conductor of this ensemble at the Espinho Music Festival (Portugal), Zagreb Biennale (Croatia), Bernaola Festival (Spain), and Schleswig-Holstein Music Festival (Germany), as well as major Hungarian music festivals. He is the artistic director for the annual Hommage à Ligeti concert series put on by the Palace of Arts – Budapest. Since 1990 he has been a Professor at the Franz Liszt Academy of Music. He has also held numerous master classes around the world. 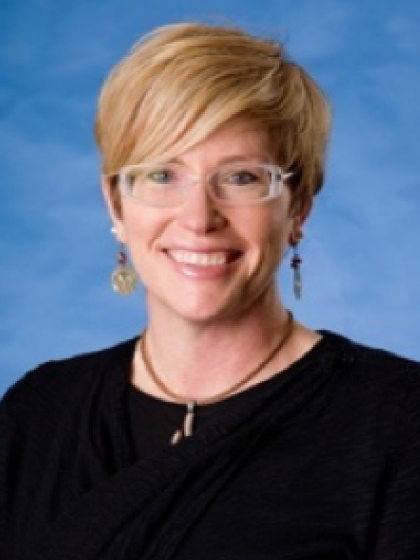 Dr. Julie Hill, Director of Percussion Studies and Chair, Department of Music at the University of Tennessee-Martin and Immediate Past-President of the Percussive Arts Society, has received worldwide recognition as a performer and scholar. Dr. Julie Hill, Director of Percussion Studies and Chair, Department of Music at the University of Tennessee-Martin and Immediate Past-President of the Percussive Arts Society, has received worldwide recognition as a performer and scholar. Hill has presented workshops, concerts, and lectures extensively throughout the United States on Brazilian Music and the topic of music and social transformation for black women and at-risk children in Northeastern Brazil. As a member of the award winning Caixa Trio and X4 quartet, Julie has performed in Peru, Poland, Mexico, Brazil, France, Puerto Rico, South Korea, across the United States, as well as the Percussive Arts Society International Conventions (PASIC). Hill is also principal percussionist with the Paducah Symphony Orchestra. Julie is a winner of the University of Tennessee at Martin’s Cunningham Outstanding Teacher/Scholar Award, the Hardy Graham Distinguished Professorship Award, the UT Alumni Association Outstanding Teacher Award, and the inaugural recipient of the University of Tennessee President’s system-wide Educate Award. Julie has also received Member Laureate distinction from the Sigma Alpha Iota International Music Fraternity. Julie Hill is an Artist and Educator for Zildjian Cymbals, and a Performing Artist for Yamaha Corporation of America. She is an artist and endorsee for Innovative Percussion, REMO, and Grover Pro Percussion. Composer, educator, and award-winning percussionist. Since 2009, Cangelosi has served as an Instructor of Music at Concord University in West Virginia, where he teaches percussion, music theory, and music history. 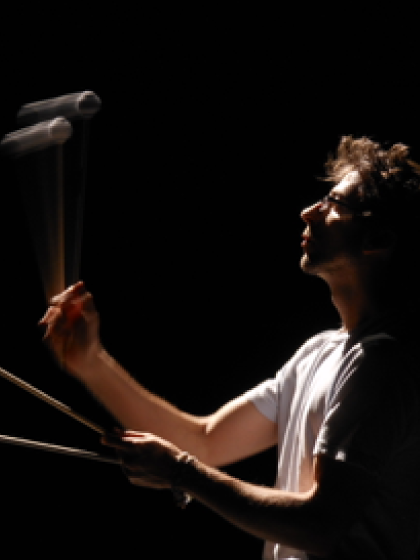 Composer, educator, and award-winning percussionist, Casey Cangelosi was acclaimed as the “voice of the new generation” by Fernando Meza during the 2010 International Marimba Festival. His composition style and boundary-pushing virtuosity has earned Cangelosi the cognomen “Paganini of Percussion. He has also been praised by the Classical Marimba League as a “marimbist of magisterial power and insight. Since 2009, Cangelosi has served as an Instructor of Music at Concord University in West Virginia, where he teaches percussion, music theory, and music history. Cangelosi has performed at the Pitea Repertoire Festival in Sweden; the 2010 International Marimba Festival, the 2011 Zeltsman Marimba Festival, and the Percussive Arts Society International Convention (2011 and 2013), all in the United States; the Tampico International Percussion Festival in Mexico; the Zivkovich International Marimba and Percussion Summer Academy in Germany; and the Patagonia Percussion Festival in Argentina. He regularly performs and offers master classes in both composition and percussion performance at universities. 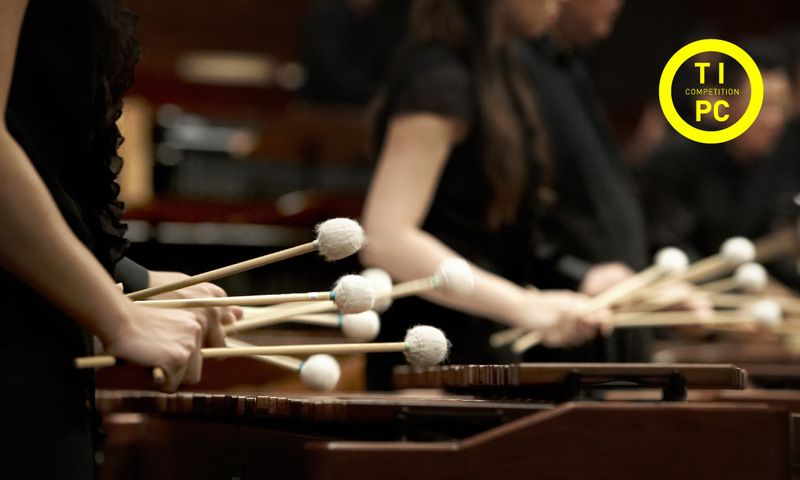 He has also served on the jury at major competitions all over the world, and has received composition awards from the Massachusetts Percussive Arts Society, Sam Houston State University, and the Classical Marimba League. Since 2010, he has fulfilled commissions for compositions by a number of performing institutions, universities, percussion companies, ensembles, and individual soloists. Casey Cangelosi has won several performance awards from academic institutions as well as the Percussive Arts Society, and is a MTNA National Young Artist. Percussionist, also a capable arranger and composer. Hwang Kuen-yean has been a member of the Ju Percussion Group since 1992. He took his bachelor’s at Taipei National University of the Arts (TNUA) and his master’s in percussion and jazz performance at the University of Southern California in 1998, and received his Ph.D. in percussion from TNUA in 2011. Hwang has studied under Ju Tzong-ching, Kuo Kwang-yuan, and Erik Forrester. Besides being a great performer. Hwang is also a capable arranger and composer. In June 1995, he was commissioned by the Japan Percussion Society to compose Formosa, which premiered at the Japan Percussion Festival in 1995. 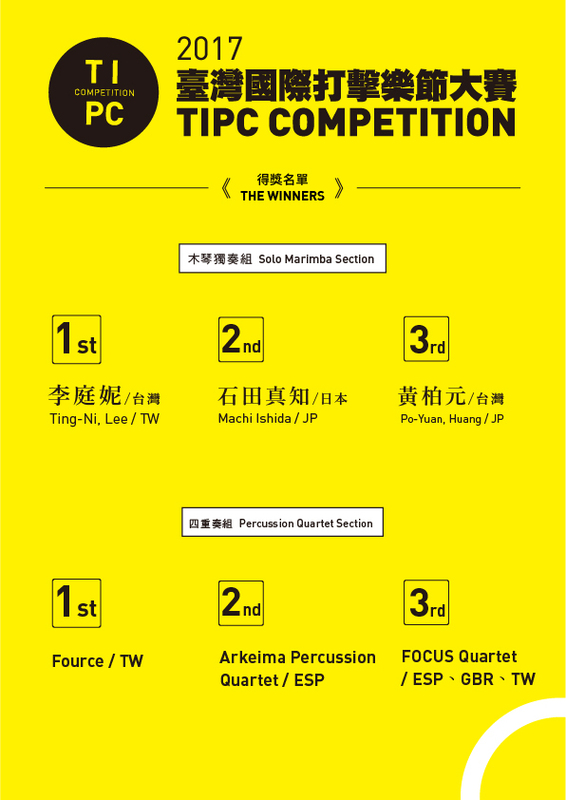 Pacific Image, composed in 1998, was given its premiere performance by the Seoul Percussion Group at the 1999 Taipei International Percussion Convention. In 1999, Hwang held recitals in Taipei, Taichung, and Kaohsiung. 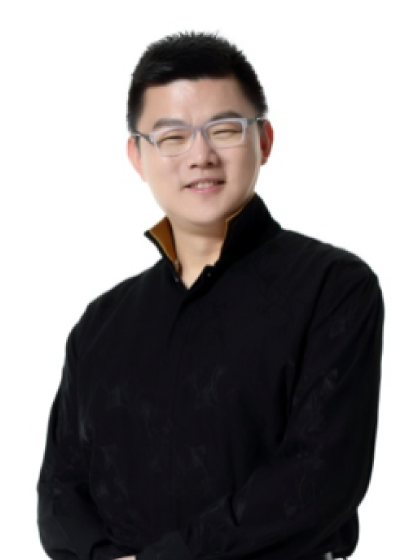 Hwang is the senior member of the Ju Percussion Group, President of the Taiwan Chapter of the Percussive Arts Society, and Adjunct Assistant Professor of Music at Taipei National University of the Arts. Chang, Chiung-Ying has the honer to receive the best composer of the 22nd Golden Melody Awards in 2011. Chang Chiung-Ying (“A-in”) is one of the most promising contemporary Taiwanese composers. Her combination of contemporary Western composition techniques with traditional Eastern cultural elements lends her works a unique appeal. A-in’s creative repertoire encompasses a great variety of styles, including chamber music, percussion, orchestra, art songs, choral work, musicals, musical theater, children's music, dance, soundtracks, commercial music, and ecclesiastical music. Her work has been performed as the world over. The Wall Street Journal has commented on A-in’s work as follows: "The climax of the chamber series was easily "Solar Myth" by Chiung-Ying Chang. This explosively theatrical work incorporated ambitious choreography, as a soloist in red opera gloves and three masked members of the university percussion ensemble acted out a Taiwanese folk tale, dancing around the marimba even as they played it." A-in received her Doctorate in Musical Arts from Taipei National University of the Arts. 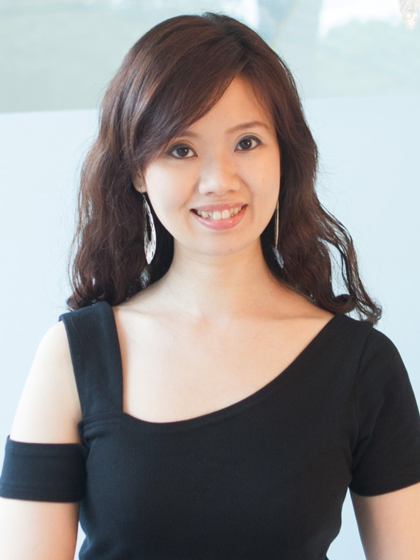 She is an Assistant Professor of Composition and Theory at National Taitung University, and has served on the faculty at Taipei Christ’s College. A-in is currently a full-time composer and resides in the United States. Hung, Chier-Hui is the founder of the Ju Percussion Group member. The composer-in-residence of the JuPercussion Group. Hung Chien-Hui is composer-in-residence of the Ju Percussion Group. She studied composition under Ma Shiu-long and Lu Yen while studying percussion with Ju Tzong-ching and Kuo Kwang-yuan. Hung furthered her studies in France from 1987 to 1995. She studied composition with Yoshihisa Taira and received a Diplome Superieur of Composition. Hung has also studied composition with Alain Bancquart and Paul Mefano. In November 1997, Hung presented All Hung's Music in concert at Taiwan’s National Concert Hall. Her composition Les Douze Lunes Du Serpent (2001), was a collaborative project with French composer Francois Bernard Mache. 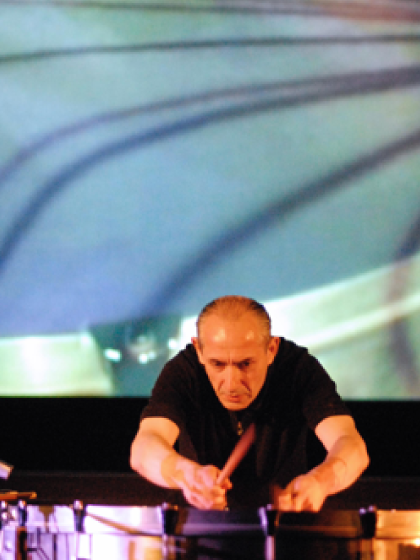 The work, commissioned by Les Percussions de Strasbourg, premiered at Les 38e Rugissants in France in 2001. The composition Mulan (2010 and reimagined in 2013) was a successful integration of percussion, Beijing Opera, and tap dance which created a new performing style –percussion theatre–and took the percussive arts to a new level.